Forget Oct. 1. Halloween season officially begins when school supply displays go up in retail stores. And "Bat-to-School" season is here! Spokane's cruel summer of wildfire smoke has already cast a ghastly ambience of despair and mandatory indoor time. Though the pumpkins up on Green Bluff aren't yet ready to carve, the spooky spirit has arrived. Let's get goth. You don't have to wear black lipstick and drive a hearse blaring Bauhaus to be goth. You don't even have to be clad in all black. If you're a Halloween lover or fan of fall, then crunch-stomping those first dead leaves brings you joy, not woe. You cackle with glee when you spy a once-shuttered building converted into a Halloween Express store — impermanent as a carnival. 1. Goth is easy to spot because of obvious markers like a head-to-boot black wardrobe. Most people are familiar with popular goth touchstones such as Anne Rice and The Addams Family. Tim Burton is goth. The moon is goth. Emily Dickinson = Queen Goth. 2. Casual goth is what I'd consider myself. I'm a sensitive, astrology witch, tarot-reader poet... who loves neon colors. Interests and actions define a casual goth more than appearances. Dancing alone to Joy Division is casual goth. Observing Pagan holidays? Casual goth. 3. Goth lite means pleasant, mom-friendly goth-ish symbols that anyone can enjoy. Choker necklaces and crushed velvet are goth-lite. Scarf-waving, lace-loving Stevie Nicks is goth lite. 4. Demigoth is a subtle kind of goth. It's more of a bitter attitude. Garfield — with his dry, dark sense of humor — is demigoth. Most moody Scorpios and kids with morbid fascinations are demigoth. There are many ways to worship the night. When I was a kid I devoured books on the paranormal and savored episodes of The X-files and Unsolved Mysteries. Since I found slasher films too disturbing and often misogynist, I rented movies like The Lost Boys and The 'Burbs. 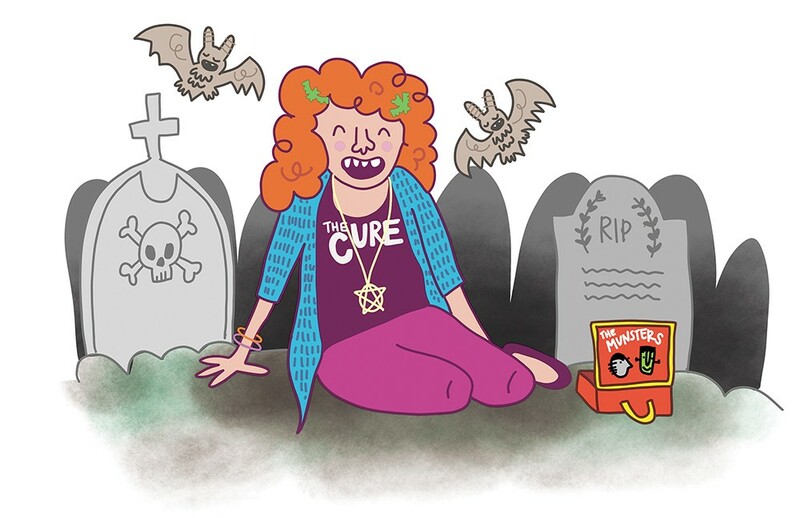 By 13 I had a pet rat and carried a coffin-shaped purse — yet still wore bright floral prints. (Casual goth!) Growing up in a desert climate with sensitive skin, I actively avoided the sun. I hid from Yakima's summer heat by cutting and pasting together zines in my room. Mom-friendly Stevie Nicks is "goth lite." As I write this, I'm wearing a Cure T-shirt; earlier today I used a parasol. Plastic bats and jack-o'-lantern lights adorn my home year-round. Does my personal history include a marriage proposal inside Disney's Haunted Mansion? Yes. Goth means staying curious about mysteries. Goth means finding beauty in the reviled. Snakes, spiders and mourning jewelry are fascinating, not "bad." This human experience includes bliss as well as excruciating pain and longing. Might as well be honest about that. Goths aren't afraid to confront uncomfortable truths like: We'll all become skeletons. Halloween — gothest night of the year — is a way to laugh at death with candy and capes! Autumn's frosty chill also means spooning season is approaching. All summer our sweaty bodies pumped out pheromones of physical attraction. Now it's time to get tender and cuddle up through another brutal Spokane winter. No stranger to deep sighs and intense feelings, goths generally embrace intimacy and burning, swooning love (see: The Crow, Romeo + Juliet). Yet goths know there's also romance in solitude. So while the activities in the following list would make romantic Spokane dates, you can certainly enjoy them solo. Carpe noctem! Graveyard strolls are great ways to glean local history. My favorite cemeteries in Spokane are Fairmount and Greenwood. The hilltop location of Fairmount makes it more scenic than scary, but its old stone buildings and vast mausoleums are plenty creepy. Greenwood Cemetery's valley locale increases chances of fog and mist. Just scram before sundown, because those gates do shut and lock at dark, trapping your car inside. Spokane Parks & Recreation even offers guided cemetery walks through Greenwood — led by "Gothic Historian" Chet Caskey — some Sunday afternoons, September through November. A paranormal enthusiast, Caskey also leads walking ghost tours downtown on certain weekend nights, September through November. Bundle up and hold hands. You'll tour the Steam Plant and other purportedly haunted buildings like the Montvale Hotel. This town is full of mysteries that refuse to die. Black lights! Fun-in-the-dark Space Mountain vibes — but without nausea! Raver goths will be glad to know most Spokane bowling alleys offer some version of "Cosmic Bowling" on weekend nights. Valley Bowl does. North Bowl has "Moonlight Madness" on Fridays and "Lucky Lights and Strikes" on Saturdays. Lilac Lanes offers "Cosmic Bowling" weekend nights, too. BYO glow sticks. The Gilded Unicorn and Hogwash Whiskey Den are low-lit, below-ground hideouts that are perfect for holing up and perhaps pulling tarot cards. Durkin's basement bar, a former speakeasy, is another eerie option Wednesday through Saturday. Jedi Alliance on Boone is a massive building dedicated to arcade games of the past. Open Friday through Sunday nights, the place is an almost windowless, cave-like maze of rooms within rooms. An Elvira pinball machine and a movie memorabilia museum in the basement (with an emphasis on horror) make it extra goth. Zines are self-published, photocopied mini books that require hours of indoor time to create. Therefore zines are goth. Spokane's own zine festival takes place on Oct. 6 at the Bartlett. You can tour tables of zines and buy directly from authors and illustrators. Rare books, occult titles and the intoxicating scent of yellowed pages and dusty covers are waiting for goth bookworms at Giant Nerd Books on Monroe. Plus, the art on the walls usually involves some kind of monster or framed animal skeletons. The original print version of this article was headlined "Casual Goth"